Careful use of mini-roundabouts can hold the key to making our communities more liveable. In my experience it has proved possible to achieve good results in small towns and villages using mini-roundabouts and traffic calming to make the whole environment more pleasant for everyone. This was achieved in Borehamwood, Herts where the majority of Shenley Road, the main shopping street, was re-constructed to create a length of single lane dualling with mini-roundabouts at the key junctions and speed tables at regular intervals between. There are no pedestrian crossings as such but several points where pedestrians are directed, including of course all of the speed tables. Pedestrians tend to dominate in such an environment. This scheme won the Urban Street Environment Award in 1994, below are two images. 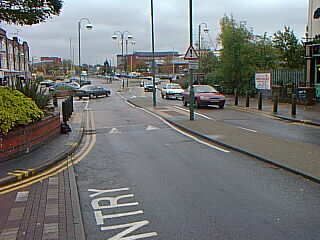 A general view of Shenley Road which operates as single lane dualling. This scheme shows what can be done using physical layouts. There is not a traffic signal in sight! It is VERY pedestrian-friendly and has an excellent safety record. A view from the car. These speed tables, although much improved since my last visit should in my view be redesigned using H-ramps to access them; it was noticeable that car speeds have gone up a bit. I took a bus ride over the tables and they remain very uncomfortable. Something similar on a smaller scale was achieved in Datchet, East Berkshire where there had been demands for improvements for many years. Originally the mini-roundabouts were rejected as they would increase capacity and hence demand, but some years later their traffic calming value led to acceptance of the scheme. Speed cushions have been added to some of the links to keep speeds down away from the junction points. It took many years to convince the locals of the benefits of a scheme such as this. But it works! 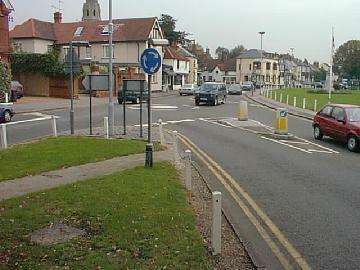 Two views of The Green, Datchet, East Berks showing the two mini-roundabouts at a scissor junction. There is about 50m between the junctions where a zebra crossing is provided. The traffic benefits of the two mini-roundabouts have been considerable. Also the village used to "lock-up" regularly without these and drivers used to need a "rubber neck" to emerge safely from the side-roads (on the right in each case). There is great scope for exciting designs of crossroads using a mini-roundabout, speed table(s) and entry narrowing. 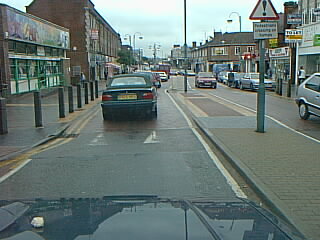 The alternative is the depressing use of traffic signals or leaving the junction a priority junction. I know which I would prefer! 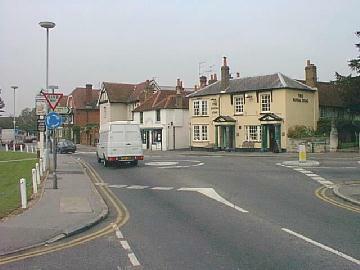 This shape is typical of many crossroads in the UK and also America. I believe this is a way forward avoiding those unpleasant one-way systems and making the junction "friendly" for everyone. The whole junction is on a speed table which is entered over H-ramps or equivalent to make the vertical shift kinder for buses. Pedestrians are guided to their crossing points not by guard-rails but by planting. The yellow areas are overrunnable in extremis and there are normal overrun areas on the four corners. Build-outs shorten the pedestrian routes which deflect very little from the desire line. In this environment parking can take place beyond the build-outs and a central reservation would provide easy crossing points for pedestrians and the whole thing could be landscaped - beautiful!! It can be done - how to lay out a large crossroads for everyone! So, which way forward for these urban and village environments? High installation and maintenance costs? Or do we appreciate that by keeping speeds under control it is often not necessary to give pedestrians and cyclists priority, as the environment is comfortable enough for them without it. It seems to me that these two scenarios are mutually incompatible. I look forward to greater use of the physical layout design for low speed operation rather than the way things have gone so much in our urban areas. It is possible to achieve great things as has been shown at Borehamwood, Herts, UK.